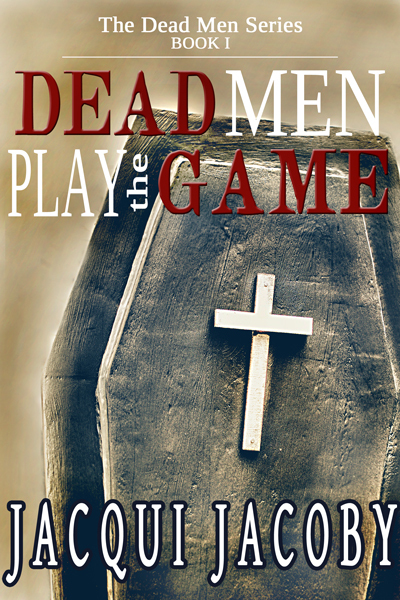 DEAD MEN PLAY THE GAME by author Jacqui Jacoby is a July 2015 release by Bodycount Productions Inc.
Ian Stuart is a barman in a pub but lives life with his own set of rules. He is not into picking women who frequent the bar. Then in walks Ashley Barrow, a detective working the most complicated case of ‘Blood-Letting’. Ian takes a look at her and falls instantly! But would Ashley return his feelings? What would happen when Ashley discovers the secret Ian is hiding? Could he survive when Ian’s enemy comes looking for him and Ash is caught in the middle? Read DEAD MEN PLAY THE GAME to discover all the secrets and mysteries of this chilling at times, yet warm and tender too, story. The relationship depicted in this story between Ian and Ash as well as between Ian’s roommates would make you mushy. Author Jacqui Jacoby did a great job of bringing to live on the pages a group of people who would stay with us for a long time. 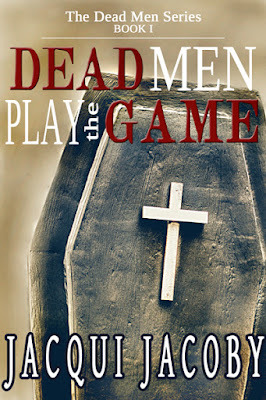 I’m eagerly looking forward to the next book in the series. Ian Stuart has lived a long time and shares a house with four friends they live by strict rules and are always there for each other Ian works hard but only nights you see Ian and his friends have a secret they must keep although they are very different from the normal vampires they still have things they cannot do but the instant Ian meets Ashley the sparks fly Ian has never felt this way about a woman before and he has lived many years and moves around at regular intervals to keep their secret. This is a journey to an eternal HEA that really will have you on the edge of your seat and turning the pages as Ashley's life gets changed by another vampire who is very cruel and wants to get back at Stuart when she is left so ill that Stuart and his friends are not sure what will happen and life is getting more dangerous you will be anxiously cheering them on and smiling at the banter between them all. This is a story that is very well written the characters come alive on the page there is danger love and hope as Ashley and Ian fall hard and fast for each other in a sensual journey that has lots of ups and downs as well as a very sensual romance and I loved getting to know the other four members of the den Travis, Jason, Quinn and Evan who I am sure will have their own stories to come thank you for a great story that I highly recommend.